PHOTO BY ZACH BAKER Tiffin University’s Heidi Marshall, a Clyde graduate, runs after laying down a bunt in the first game against Hillsdale Saturday in Tiffin. The bunt went foul. A year ago, Heidi Marshall wasn’t even playing softball. The star Clyde shortstop missed her senior season after tearing her ACL during basketball season. Now, Marshall is back on the field in new surroundings. She’s at a new level, learning a new position. But she’s back playing every day, and succeeding. Marshall — who was a star shortstop for the Fliers — is now at third for Tiffin University. She’s played in all 35 of the Dragons’ games, and is hitting better than .300. Not bad for someone who missed all of last season. Tiffin University coach Jeff Nickerson — who became the program’s all-time wins leader earlier this week — said he was unfazed by Marshall’s injury. Marshall has joined a young team. The freshman is one of a number of first-year starters on the Dragons. 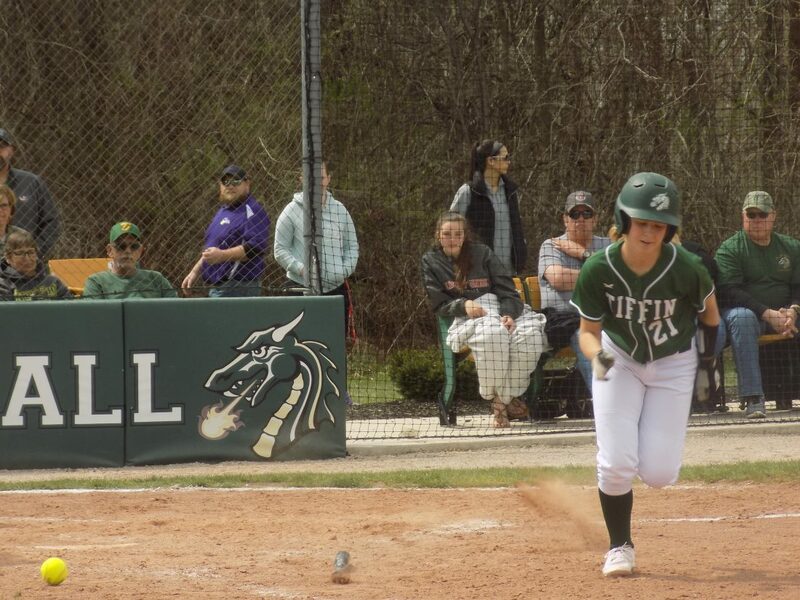 The Dragons had a big day Saturday, coming back from a 6-0 deficit in the sixth inning of the first game of a doubleheader with Hillsdale. The Dragons scored five runs in the sixth, and then, down to their final out in the seventh, Libby Crow cranked a solo homer down the right field line to tie it. The Dragons won the game 7-6 with a run in the 10th. Marshall didn’t have any hits in Game 1, and admitted she had been struggling at the plate recently. “Right now I am struggling hitting, but I think that’s all in my head, and I can just get out of that,” she said. In the second game with Hillsdale, Marshall ripped an RBI single, and the Dragons won 4-3. It was TU’s eighth consecutive win, and the team improved to 23-12, 13-5 in the Great Midwest Athletic Conference. Marshall is batting .307 with four doubles and 20 RBIs. And she’s not the only area high school player helping the Dragons. Mohawk graduate Chelsey Trusty was used twice as a pinch runner Saturday, scoring a run. Trusty, a sophomore who is listed as a catcher/utility player, has played in 25 games, and has seven hits in 38 at-bats. And Marshall said she’s happy at TU. “It’s really nice. We get a lot of local kids, and the whole team just has a good camaraderie, and we all get along,” she said.